Ok – agreed I made that up, however it may not be too far from reality given the way the second batch of Xiaomi’ Mi3’s were sold today. The video below shows you exactly what thousands of users experienced who were desperately hoping to get their hands on much coveted Mi3 on Flipkart. This is not an edited video. It happened in real-time. Infact, the “entire stock” was over in less than 10 seconds from the time it was available. Xiaomi’s Hugo Barra proudly announced on Twitter that Mi 3 Flash sale was over in 5 seconds – Here is Tweet. 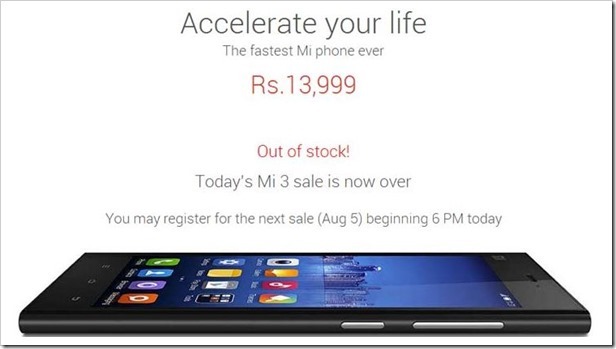 Interestingly, there was no word on the number of Mi3’s that were sold in this flash sale. In all probability, it could have been in lower thousands or even few hundreds given that they went out of stock immediately! Obviously majority of buyers were frustrated and vented out their anger on Social media sites, especially twitter. Here are some of the choicest ones that we have featured below here. Xiaomi Mi3 sale got over by the time people learnt how to pronounce XIAOMI. Now, one thing is clear the number of Mi 3 that were available were not in big numbers. Some of the curious techies looked at the import numbers and found that Xiaomi had shipped around 10,400 Mi 3units to Flipkart. However, it still does not prove that those many number of units were available in this Flash sale. The next sale is coming up on August 5th, and some of the units from this imported batch may be very well part of that sale. Whatever said and done, two things are sure. Mi 3 has managed to create huge demand for their phones and at the same time they have also attracted wrath from many of their prospective buyers! So, were you one of those frustrated customers? Do let us know! 3 step process on how NOT to buy Xiaomi Mi3 from Flipkart! I think flipkart is trying to make a hype by hiding rest of the stocks. When the demand increases more and more people comes to know about Xiaomi. Indian dumb news medias will follow it.. saying record sales blah blah. The thing is flipkart is doing it deliberately.. It said something like, sorry you haven’t registered for this sale, but I actually did. So I tried again and then it said out of stock.